Today is World Egg Day, and we have partnered with the American Egg Board (AEB) to be an Ambassador for their Good Egg Project program. From now until April 2014, we will be sharing our love of the egg with you, as we promote healthy eating habits while enjoying the egg. When we were contacted about becoming an Ambassador to help raise awareness, it was a no-brainer for us. We love eggs, but even more so, the program is dedicated in helping fight child hunger. 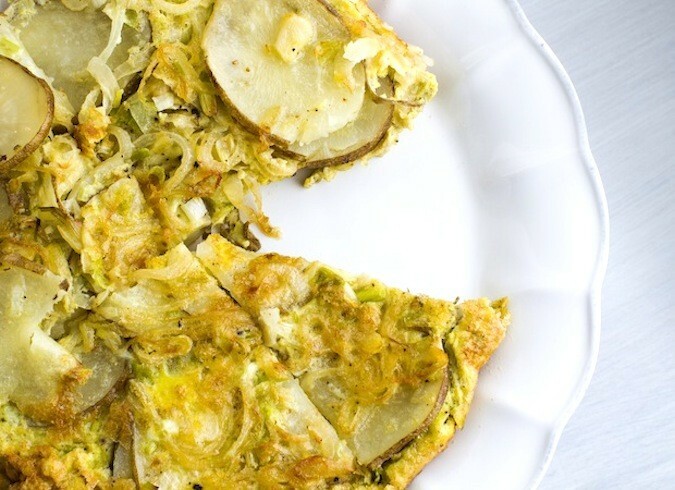 This recipe for a Spanish Tortilla is a regular dish that we enjoy very often. It is quick and easy, and can be enjoyed for brunch or event for dinner. Eggs are a staple so it easy to whip up in no time. The American Egg Board (AEB) connects America’s egg farmers with consumers to communicate the value of the incredible edible egg™. They do this by helping people understand more about the convenience, affordability and nutritional value of eggs. AEB represents all types of egg production/shell eggs including cage-free, conventional and organic (they do not support specific brands or egg substitutes). The Good Egg Project was created by America’s egg farmers to educate people about where their eggs come from. That includes showcasing different types of egg farms across the country and the production systems they use to help provide people with different choices when it comes to eggs. You can find out more about the Good Egg Project and meet their egg farmers on AEB’s official website www.IncredibleEgg.org, which includes a dedicated section for the Good Egg Project. Eggs in our opinion get a bad rap as being too fatty, and not good for our diets. When in fact, eggs deliver the perfect nutrients. 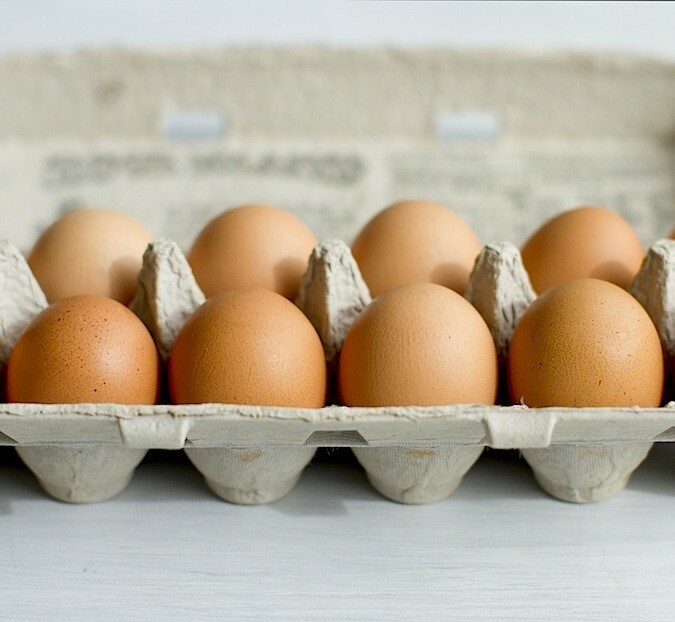 A recent USDA study found that eggs are 14% lower in cholesterol, and 64% higher in vitamin D. As well eggs provide a significant role in body energy, weight management, brain function and muscle strength. Having a hard time getting going in the morning, cook up an egg, and you will gain instant energy. All of this goodness while be economical. At approximately $ 0.15 per egg, they provide excellent natural source of protein for 70 calories each. Now Lower in Cholesterol. According to new nutrition data from the United States Department of Agriculture’s Agricultural Research Service, eggs now have 14 percent less cholesterol (down from 215 mg to 185 mg) and 64 percent more vitamin D. In addition, more than 30 years of research have concluded that healthy adults can enjoy eggs without significantly impacting their risk of heart disease. Protein Power. Eggs are all natural and one of the highest quality proteins available, providing all nine essential amino acids. The high-quality protein in eggs provides the “building blocks” your body needs to grow and perform properly. The amount and quality of protein you eat directly affects muscle mass, strength and function; when eaten after exercise, protein encourages muscle tissue repair and growth. Breakfast Boost. Research shows that eating high-quality protein foods for breakfast, like eggs, can help you and your family feel more energized and satisfied throughout the day as compared to eating more protein at lunch or dinner. And multiple scientific studies demonstrate the cognitive benefits of eating breakfast, such as improved memory recall time, improved grades and higher test scores. Eggs Make Cents. Eggs are very affordable compared to other high-quality protein foods. At just $0.15 each, eggs are the least expensive form of high-quality protein per serving in today’s marketplace. Fast & Easy. An egg breakfast is quick and easy. Simply beat an egg in a small bowl or coffee mug, place on high heat in the microwave for 60 seconds and add it to a toasted whole-grain English muffin. Top with low-fat cheese and a slice of tomato for a balanced meal. It’s a speedy and satisfying start to the day that takes less than two minutes to prepare. Infant Development. Eggs are an excellent source of choline, an essential nutrient that is particularly important for developing fetuses and infants. Pregnant women can help reduce the risk of certain birth defects and promote brain and memory development by getting enough choline in their diets. Powerful Package. Eggs are all-natural, and one egg has lots of vitamins and minerals all for 70 calories. At 70 calories apiece, eggs are nature’s original form of portion control. A hard-cooked egg is incredibly easy to prepare and is a perfect on-the-go snack. Incredible Weight Loss Results. High-quality protein, like the protein in eggs, can help overweight dieters lose weight. Recent research shows that eating eggs for breakfast can help overweight dieters lose more weight, lower their body mass index and shrink their waist more than eating a bagel breakfast of equal calories. Eggs-cellent Vision. Lutein and zeaxanthin are two antioxidants found in eggs that may help prevent macular degeneration, a leading cause of age-related blindness. While eggs contain small amounts of these two nutrients, research shows that the lutein and zeaxanthin from eggs may be more bioavailable (or better utilized by the body) than from other sources with higher content, including supplements. Long Lasting Energy. The protein in eggs provides steady and sustained energy because it does not cause a surge in blood sugar or insulin levels, which can lead to an energy “crash” as levels drop. Essential Nutrient. Choline, an essential nutrient found in the egg’s yolk, is necessary for normal cell activity, liver function, and transporting of nutrients throughout the body. In addition, recent research has associated choline with a 24 percent reduced risk of breast cancer.9 One egg provides 125 milligrams of choline or roughly one-quarter of the recommended daily amount for adults. Eggs Give Back. America’s egg farmers not only provide quality eggs, but they give back to their communities as part of the Good Egg Project. Visit incredibleegg.org/good-egg-project to learn more. While eggs are a good source for breakfast, and we enjoy them at least 3 times a week, they are also a great protein source for other meals during the day. One recipe we enjoy making as a lighter dinner option is a Spanish Tortilla, which is filled with goodness. 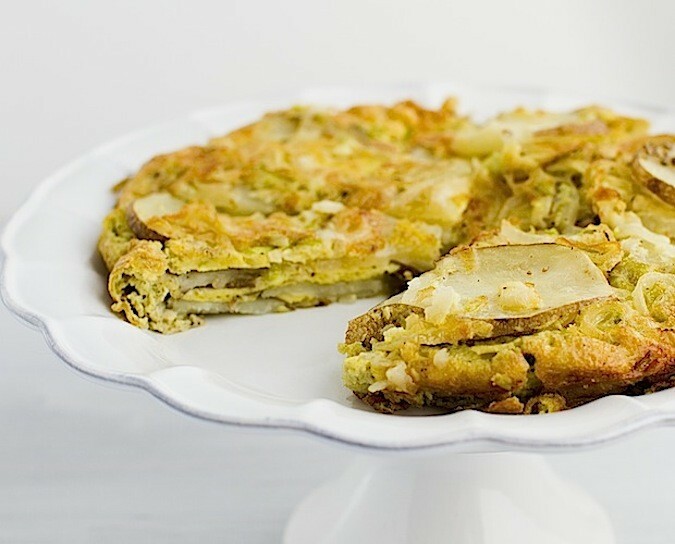 Fresh eggs, potatoes, leeks, and olive oil make this a winning meatless option for dinner. It is filling, healthy and perfect when paired with a green salad or braised kale. How are you adding eggs to your diet in creative ways? Put the potatoes into a large pan of cold water, over medium-high heat on the stove. Turn the timer on for 20 minutes. Bring to a boil. While potatoes are cooking, cook the leeks with the olive oil, in an oven proof skillet, until they are soft. Add the garlic, stir, and cook for 1 minute. Remove from the skillet set aside in a small bowl. Slice the potatoes thinly; I like to use a mandoline. Add the potatoes to the skillet, lightly stir. Add the leek mixture. Cook for about 3 minutes. Pour the eggs over the top of the potato mixture. Over very low heat, cook, the mixture for 2 minutes. Remove from the heat, and place the skillet into the oven and cook for 20 – 30 minutes, until puffed and golden. Remove from the oven and let sit for a couple minutes before slicing. Disclosure: We are compensated members of the American Egg Board (AEB). As always, all opinions expressed are my own. 10 Responses to "Spanish Tortilla"
Lovely Spanish tortilla. I wanted to make shakshuka but maybe switching my plans after seeing this. :) Love the added leeks in this recipe. Congrats on the partnership! Eggs are the perfect food in my opinion. Can't live without them. Besides, how would we bake all those delicious goodies we like to make and eat? Hope you're doing well! I love everything about this, and would definitely devour it for dinner! Love the photos, very "apeeling" potato shots as well as the eggs. That's not the typical spanish "Tortilla de patatas"!! !